How to get from Alicante Airport to Benidorm, Calpe or Denia ? ( I confirmed the second stop at Avenida Europa 8 by phone with Alsa – since their website is only mentioning the stop at Paseo Els Tolls). So good news for all of you having a hotel close to the center of Benidorm. update – please note, the bus runs 13 times per day in each direction. The Benidorm Bus is currently priced around 8 Euro for a one way ticket and 16 Euro for a round-trip. You can buy the ticket directly with the driver at Alicante airport. 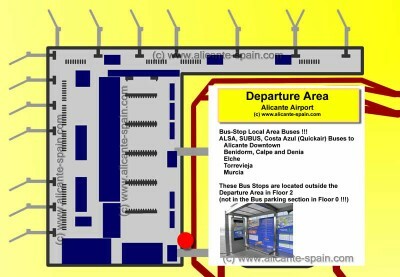 The direct Benidorm bus departs at Alicante Airport outside the departure area in Level 2 of the terminal building. (updated:Thanks to detailed info from our reader Sue Oldfield). You take the Alicante Airport Bus to Benidorm to get to Calpe via Benidorm. You need to change Buses at Benidorm’s very modern bus station. When you board the bus ask for a ticket to Calpe and you should be given two tickets. If you have only been given one ticket you need to call at the booking office to have your ticket validated for the next stage of the journey. You will have around a 20 minutes waiting time in Benidorm for the connecting bus to Calpe. Compared to using the tram, this is a much quicker way to get to Calpe from Alicante airport. If you dont want or can’t take the direct bus to Benidorm, you can alternatively get a bus to downtown’s central bus station and get another bus to your final destination from their. 1. 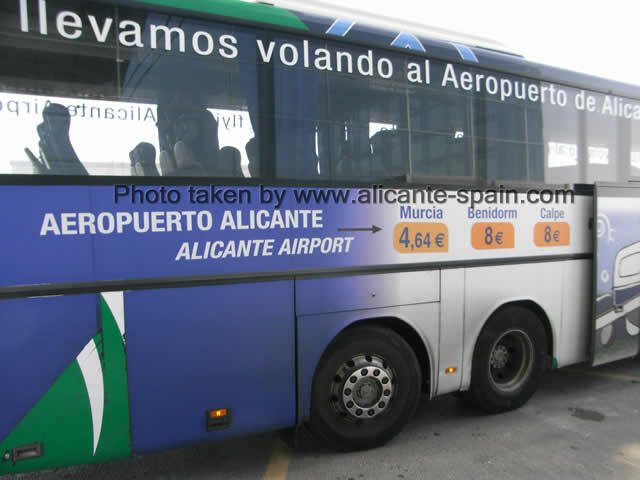 Take the Alicante airport to downtown Alicante bus ( the C-6 line) details here. Exit the airport bus at the Alicante bus station ( stop is at Calle Pintor Lorenzo Casanova 26). The Airport Bus C-6 will drop you right beside (just ask the driver to let you out at “estacion de autobuses”). 2. At the downtown Alicante bus station you board your bus to Benidorm, Denia or any of many different cities around the Costa Blanca. Alicante Central Bus station is quite big, as city to city buses services are very common in Spain. Spanish Timetables are always subject to “change” or vary depending on … you name it. So do not be surprised if you bus to Benidorm and Denia might leave “some” (sometimes some more) minutes later. The easiest and fastest way to get from Alicante airport to Benidorm, Calpe or Denia and finally to your hotel is to take a taxi. The trip will take around 45 minutes to Benidorm and Calpe. If you need a Denia taxi it should take you about 75 minutes from the airport depending on traffic conditions. Cost varies and will always depend on which part of Benidorm, Calpe or Denia you need to go to. A rough estimate on taxi fares on the above table here. 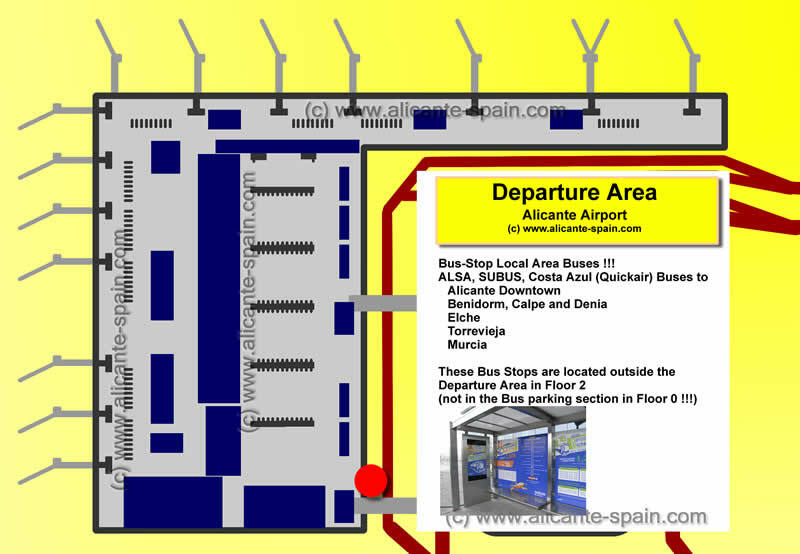 >> Details on where to catch a taxi at Alicante airport here. Alicante airport does not have any train connection whatsoever. 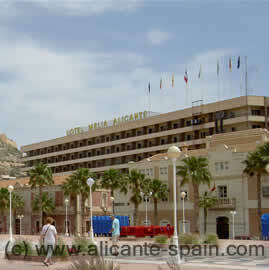 The only way to get on a train to Benidorm, Calpe or Denia is via Alicante downtown. 1. Take the Alicante airport to Downtown Alicante bus.Exit the bus at station “Puerta del Mar” which is right at the beautiful harbor area of Alicante. 2. At Puerta del Mar you board the TRAM local street car train and head on to Benidorm and Denia. Several private shuttle companies offer bus or car transfer services from Alicante airport to Benidorm and various cities around the Costa Blanca. Especially when traveling in groups of more people you might want to check out services like Resorthoppa , Shuttledirect or Beniconnect transfers ahead of time. Could be a viable alternative. 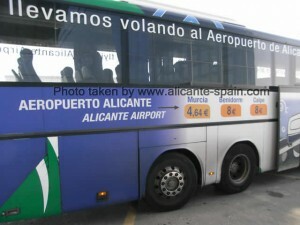 For sure not the cheapest form of transfer from Alicante airport to Benidorm, but most likely the most convenient one. Of course to rent a car for your vacation will be much more expensive than the cheapest direct bus transfer ticket to Benidorm. But a rental car will get you directly to your hotel or apartment and you will get the convenience of having the flexibility of a car during your entire holidays. If you are travelling as a family or a group of various friends, hiring a car could turn out cheaper than you think.